Oxley Holdings’ Verandah Residences, a new launch private residential project in Pasir Panjang took off on its 1st day of sales over the last weekend (on Saturday), with 129 out of 170 units sold over 2 days – at an average per square foot (psf) price of $1,815. All the 1-bedroom, 1-bedroom plus study, 2-bedroom and 2-bedroom premium units are all fully sold at Verandah Residences. It was mentioned by Oxley Holdings that the strong demand mainly came from home buyers and property investors – around 85% of them were Singaporeans, while the rest being Singapore Permanent Residents (SPRs) and foreigners. 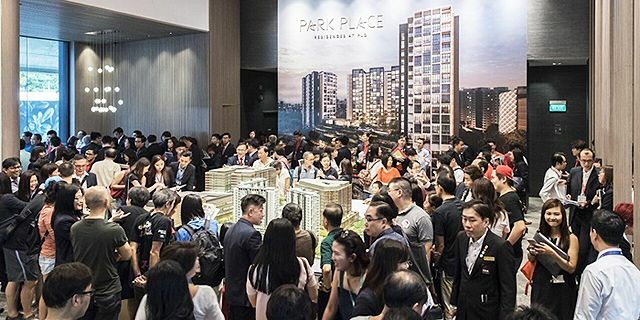 On the other hand, Lendlease sold 149 out of 219 units in its Phase 2 launch of Park Place Residences at Paya Lebar – at an average of $2,000 psf, bringing the total number of units sold in the 429-unit Park Place Residences to 359. The first launch, in fact, took place back in March 2017 when Lendlease was able to sell out all 210 units released in Phase 1 within a single day before closing its showflat. Prices at that time were only averaging around $1,806 psf – marking an approximate 10% increase in prices for the Phase 2 launch of Park Place Residences. It was noted by market watchers that the strong take-up rates in both new launch projects are testaments that the home-buying demand is strong and other property developers will find this encouraging for them to sell their own new launch projects at expected prices. Since the announcement of a 3.1% quarter-on-quarter price increase in the private residential sector by URA earlier this month, consultants believed that the property price index could possibly surge from the initial estimate of 3% – 8%, eventually rising to 7% – 15%. Next up, all eyes will be on UOL Group as it prepares to open the showflat of its 139-unit Amber 45 for preview. It was mentioned that the developer is expecting to launch the freehold Amber 45 at an average psf of $2,300.